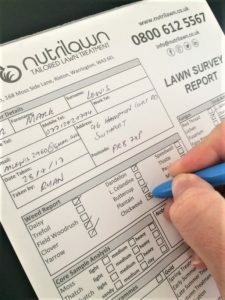 Whether you intend to become a valued Nutrilawn customer or not, our Free Lawn consultation is a wise move. For many gardeners, after years of tackling their own lawn issues and eventually becoming frustrated or wondering whether it could be better, one visit from a NPTC Certified Greenkeeper was the best step they made towards a lush, green and truly healthy lawn. Once these factors have been analysed, we’ll interpret what that means for you. We’ll give you advice should you choose to treat your lawn yourself and, at the same time, we’ll provide a tailored quotation so you can evaluate the best course of action. Regardless, we’ll provide advice on proper mowing and, if required, can refer you to local, reliable Gardeners whose work we have seen and are happy to recommend. There’ll be no pressure in this whole process – you’ll be talking to a Greenkeeper, not a Salesman. Click here to arrange your Free Lawn Consultation and achieve your lawn care goals as soon as possible.